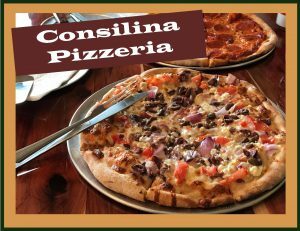 Consilina Pizzeria is a unique taste of Italian countryside cuisine. Our hand-tossed pizzas feature a light and crispy dough (made in house from scratch) and are wood fired in a brick oven. We make our sauce with fresh ingredients to bring out distinct aromas and authentic flavors. Our extensive beer and wine selection and big screen TVs offer a relaxing opportunity to catch your favorite sports game.